This post (another nail in the coffin of nutritionism) is yet another example of what can happen when we practice nutritionism. This is a great example because it’s actually so seemingly simple. It’s been very clear for many, many decades that calcium is intimately involved in making healthy bones. In America, where we have vast areas of land where we can grow food for cows, we have largely adopted the idea that we get our calcium from cow’s milk and cow’s milk alone. We as a nation have hung onto the concept; with no small amount of help from lobbyist and powerful Dairy Councils and dairy associations, who end up getting it written into Food Pyramid models. Education by advertising has convinced Americans that diary products are super good for you, and one of the main arguments has been that you have to drink milk and eat dairy products to get your calcium. The word “calcium” by the repetition of advertising has been transformed into the mental image of a white substance that makes milk so pure and white. If you do not consume enough milk, where will you ever get enough calcium? Dietitians are trained to look for the dairy in patients’ eating plans; and if the patient doesn’t drink milk, they advise them to drink milk. Some people, of course, have come from cultures that do not drink milk; or do not have the ability to consume milk without a bad ‘tummy ache’ or worse. For those people, it is generally recommended, that they consume a calcium supplement; as though calcium is the only nutrient that is in milk (but that’s a discussion for another day.) The backhand of nutritionism is to prescribe a supplement containing just that magical nutrient (the forehand is to feature it in advertisements for a product just brimming with the nutritional magic). This all leads me to an editorial in The British Medical Journal. Mark J. Bolland of New Zealand and his colleagues assessed whether calcium supplements increased the risk of cardiovascular events in people diagnosed with, or at risk of, osteoporosis. They found that the calcium supplements did increase the risk of myocardial infarction, but at least during the duration of the study, they did not find a significant difference in the risk of stroke, or death. He found that the increased risk occurred early after calcium supplementation (his study had a median follow-up of 3.6 years). Although it increased the risk of heart attacks by 25%, it didn’t increase the rate of death – well, that’s a big relief. You are more likely to get a heart attack, but at least none of the people who did so died within 3.6 years. Hopefully you will be like them and not die from it. The editorial ends with a recommendation saying essentially, that although there is limited evidence of what is involved, patients with osteoporosis should generally not be treated with calcium supplements, either alone or combined with vitamin D, unless they are also receiving an effective treatment for osteoporosis. We at Dr. Grandmas do not prescribe medicines; nor do we recommend that you stop taking medications prescribed by your physician. But we do think that you may want to discuss this risk with your physician, if you are taking calcium supplements. It is interesting to me, that in many cultures people do not drink milk; but they do eat large portions of greens. In the Mediterranean, Dr. Ancel Keys observed, “no main meal in the Mediterranean countries is replete without lots of verdure (greens).” The significance of this is that; eating that many greens is a great source of calcium and many other nutrients. In addition, some cultures consume meals prepared in pots; cooking the bones of the meat or fish for hours. The calcium and other nutrients are dissolved into the water/broth that is consumed by the family. So the point is that there are other methods of getting enough calcium, besides taking supplements or consuming dairy products. Our style of eating will certainly have to change, as we continue to learn how harmful the Western diet is to our health. I have to end with a sobering note. Dr. Grandpa reminded me that a doctrine can be fully killed off by scientific evidence, and the practice lives on, zombie-like, even though it is dead. This is because education-by-advertising reaches far more people than do reports and summaries of the scientific evidence. Moreover, the continuing education of doctors also lags years behind the latest findings of nutritional science. Please, please, don’t any of you consort with any zombie supplements years after they have been pronounced dead. 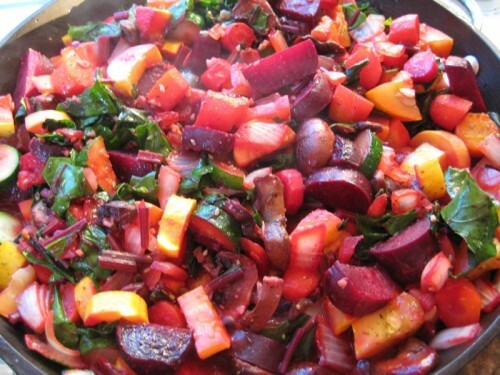 Steamed mixed vegetables with beet greens.